Last week 13 City staff travelled to Beijing, Shanghai and Hong Kong to explore ways to increase City’s engagement with China. The delegation, which was led by Professor Stanton Newman, Vice-President International, visited Beijing, Shanghai and Hong Kong, and a contingent also visited Nanjing and Shenzhen. The delegation included senior staff from four schools at City, namely Cass Business School, School of Mathematics, Computer Science and Engineering, City Law School and School of Arts and Social Sciences. The delegates visited a number of City’s existing and some potential new partner universities, including Shanghai Jiao Tong University, Fudan University, Chinese University of Hong Kong, and Hong Kong Baptist University. The group also visited two members of the WC2 Network - Tongji University and Hong Kong Polytechnic University. The WC2 Network brings together top universities located in major world cities in order to respond to the challenges and opportunities facing urban areas. The wide ranging discussions explored potential research, education collaboration and provided an opportunity to meet with key stakeholders. 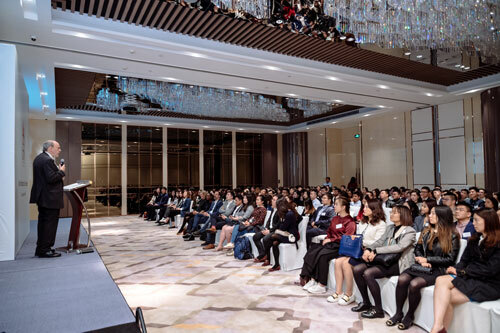 In addition to meetings with the China Scholarship Council and the British Council, Alumni and Stakeholder receptions were held in Beijing, Shangai, Hong Kong and Shenzhen, with more than 500 guests attending. Commenting on the visit Professor Newman said: “During this productive trip we strengthened existing relationships and identified opportunities for increased collaboration with Universities in the region. Not only does City have a number of university partnerships in China, it is also City’s largest recruitment market, with 784 Chinese students enrolled in 2017/18, and more than 3,550 applications from China for entry this academic year.